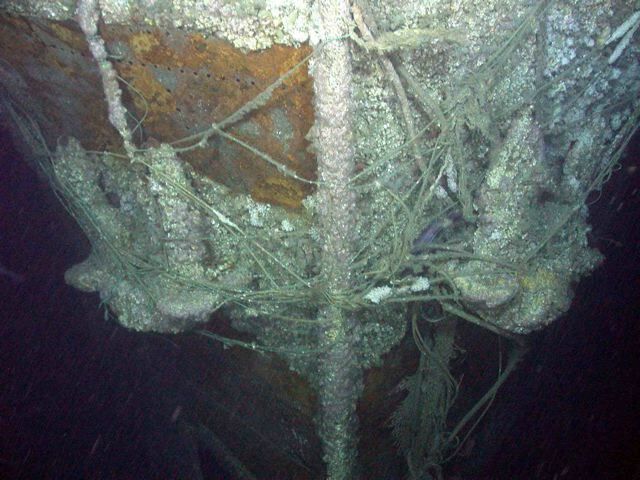 An early 20th century steel wreck, ‘Atlas’ shipwreck survey zone, its bows covered with fishing nets. © Odyssey Marine Exploration. Do you have strong feeling about fishing on shipwrecks and what, if anything, should be done to manage it? Wreck Watch encourages feedback on this major issue from opinions about better management to assessments of the scale of the issue. Any reports of discoveries of finds in nets worldwide will be dealt with in complete confidence. 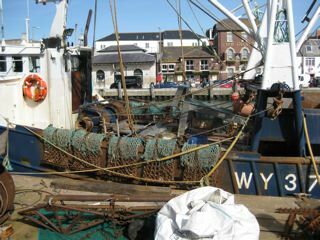 The destruction of marine habitats by fishing gear towed by trawlers and scallop dredges is a highly emotive and controversial issue within marine ecology today. In a seminal article published in Conservation Biology in 1998, Watling and Norse equated the damage caused by trawl doors and tickler chains running over seabeds to the clearcutting of forests on land, but with one great difference. “Whereas forest loss is estimated at 100,000km2 per year worldwide”, they calculated, “the area trawled annually is about 150 times as great.” Each year trawling was said to disturb an area of seabed as large as Brazil, the Congo and India combined. Typical of today’s concern is the belief of Dr Sylvia Earle, former Chief Scientist of NOAA and now Explorer in Residence at the National Geographic Society, that “Bottom trawling is simply not sustainable. The trawl nets are stripping the seabed of life, trashing ancient corals and destroying entire ecosystems… Sadly, much of it will be gone before we get the chance if we don’t act now”. In his masterly The Unnatural History of the Sea, Prof. Callum Roberts also stressed that “The seas are undergoing ecological meltdown”. 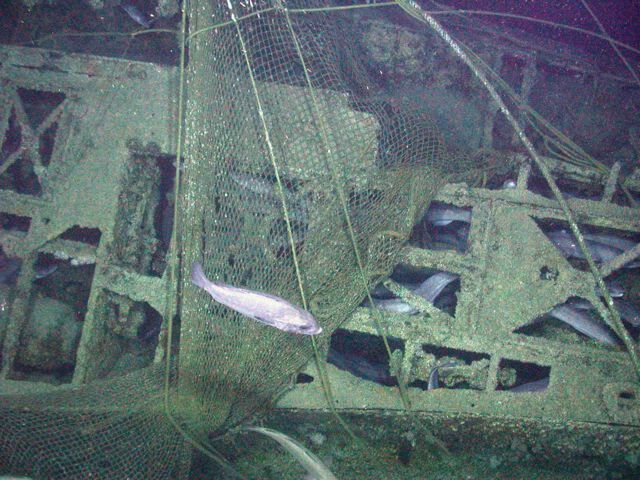 Fishing nets snagged on the wreck of a German U-boat, 'Atlas' survey zone. © Odyssey Marine Exploration. Marine ecology has seen great soul-searching and debate since the 1970s, followed by the implementation of measures such as zoning and ship decommissions to control and monitor the effects of bottom fishing on marine habitats. No such awareness exists for the world’s underwater cultural heritage. Shipwrecks are integrated elements of the oceans’ environment, but unlike fauna and flora have no natural capability to regenerate or repopulate. Once a section of wooden hull, a pot or glass vessel is struck just once, the damage and loss of data are permanent. More than forest clearcutting, the impact on wrecks and prehistoric sites is actually better compared to the ploughing of ancient sites on land. The marine reality resembles the pre-1970s neglect of sites on farm lands. Fishing impacts on wrecks have been known in the UK since 1755, when several hundred Roman bowls were snagged in Whitstable fishermen’s oyster dredge nets. Many were so well preserved that the site north of Herne Bay was dubbed ‘Pudding Pan Rock’ after the good use the fishermen’s wives put the pots to in their kitchens. Little if anything of this rare Roman wreck is believed to survive today. It is also often forgotten that the shipwreck of the Mary Rose was discovered when early divers examined the source of fishermen’s hangs in 1836. 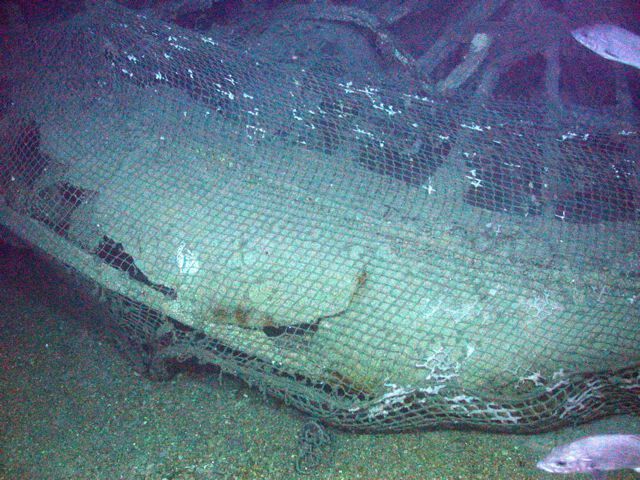 Fishing net snagged on a 20th century steel wreck, 'Atlas' survey zone. © Odyssey Marine Exploration. Following the rise of offshore fishing fleets with increasingly powerful engines in the 1950s, stories of snagged oddities reached shore more frequently, but on a random basis. In the UK, Mesolithic wood, lithics and barbed points were fished up off Norfolk and the Isle of Wight. Roman amphoras appeared in trawl nets off Guernsey and southern England. Major sites such as the 74-gun Royal Navy warship Invincible, lost off Hampshire in 1758, were brought to archaeologists’ attention after a trawler pulled up pewter pots and large timbers. An identical pattern of chance finds and reports worldwide shows that underwater cultural heritage has been turning up in fishermen’s nets since the late 19th century. In 1877 a French fisherman from Sanary brought up the bronze ram of a war galley decorated with the head of Medusa and sent it to a foundry to be melted down. Greek and Roman bronze statues have been fished up off France, Italy, Turkey and Greece since the 1950s. Off Italy and in the North Sea trawlers have netted everything from thousands of prehistoric bones and stone tools to iron and bronze cannon, copper cauldrons, pistols, cannonballs, a sabre hilt and even part of an early 18th-century decorated wooden sterncastle. 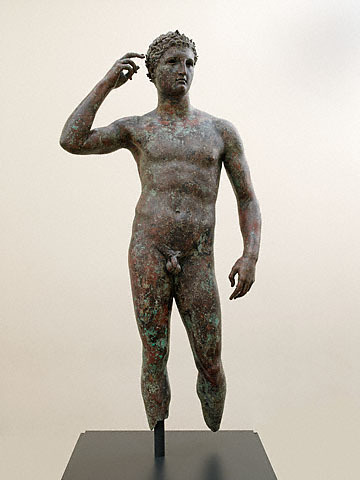 Greek bronze statue of a Victorious Youth, c. 300-100 BC, netted by an Italian trawler in 1964. J. Paul Getty Museum, Malibu. Everything from humble ancient amphoras to 70-kilogram Roman lead ingots and silver Spanish coins raining down on shrimp fishermen’s heads, not to mention literally a 3rd century AD pot of gold, have been inadvertently snagged and removed from their contexts down the decades. 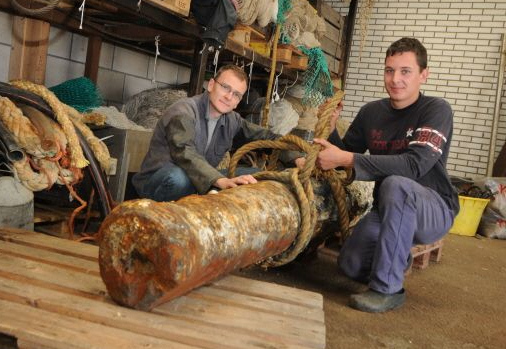 Only in 2009 Dutch Fishermen working close to the well-known wreck of the Vliegent Hart, a Dutch East Indiaman lost in 1735, brought up an iron cannon in their net. These reports are the tip of the iceberg of myriad unavoidable snags made every year. In the world’s first quantifiable study, conducted in the Western Approaches and western English Channel by Odyssey Marine Exploration and Wreck Watch, 42% of 267 recorded shipwrecks showed evidence of some kind of fishing impact. These ranged from simple trapped nets to furrows running directly through sites and flipped and dragged cannon, including a 4-ton bronze gun on the unique wreck of the First Rate Royal Navy warship, HMS Victory, lost in 1744. Along with a c. mid-17th century armed merchantman carrying a very poorly preserved cargo of elephant tusks and copper manilla bracelets (Site 35F) and the wreck of the French privateer La Marquise de Tourny lost around the mid-18th century, Odyssey and Wreck Watch have identified these three sites as being at significant risk and of such importance that they require detailed study and excavation. This proposal concerns just 0.7% of the wrecks examined by Odyssey from 2005-2008. What can be done to support fishermen from breaking or losing expensive fishing gear on unknown wrecks? What can be done to record (and in rare cases intervene) to save sites of national and international importance? Options include zoning and geofencing, although this measure is a fool’s paradise in deep waters, where controlling the movements of foreign fishing boats is legally and practically complex, if not impossible. Like the Aggregates Levy Sustainability Fund introduced to reduce the impact of gravel dredging on underwater heritage, should fishing industries contribute financially to the study and mitigation of the issue? Finally, where wrecks impacted by offshore fishing – past or present – are so important, we have an obligation to carefully record their deposits and to recover and rescue remains through excavation for the benefit of society and education. This is especially true for deep-sea sites. If the people can’t be brought to the past, sunk beyond the depths of SCUBA access, the past needs to be brought to the people. Wreck Watch recognises the difficulties facing fishermen and in no way intends to increase the burden that already makes their work so tough. Fishermen are not at fault. They have done what society has asked them to do and what fishing policy has dictated. However, if important underwater cultural heritage is to be better protected in the future, it is essential that heritage bodies, governments, archaeologists and fishermen work together to seek a new and more sensitive approach. Just as we would excavate or otherwise attempt to rescue a gravesite or archaeological deposit in a farmer’s field, we should develop a policy that recognises that the discovery of a site in the path of fisheries should warrant at least survey and in cases excavation and preservation.